These molds are just perfect for casting a single blank from Polyester Resin with the tube cased inside. Just center your tube in the mold and mix/pour the resin directly into this mold. The mold is made from Silicone so Polyester TResin will never stick to it. After Casting pop right out by bending down the ends. It doesn't get any easier than this. Most castings will save you over 50% of the resin needed over conventional casting means. Most single blank molds use about 3/4 ounce of resin to fill the mold. 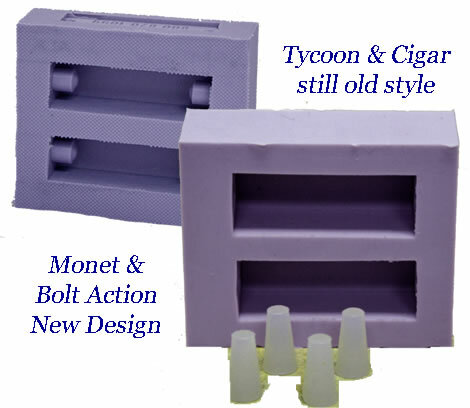 MOLD-CIG: This mold casts both the top and bottom barrels at one time for the Cigar Pen Kit.